Cut the cauliflower sprigs into thin slices. Boil over medium head. Add salt. Cook the cauliflower for 5-6 minutes. Strain and transfer to a large container with cold water. Let cool. In the same boiling water, cook the carrots for 3 minutes. Strain and cool in cold water. Line rectangular mold with parchment paper. 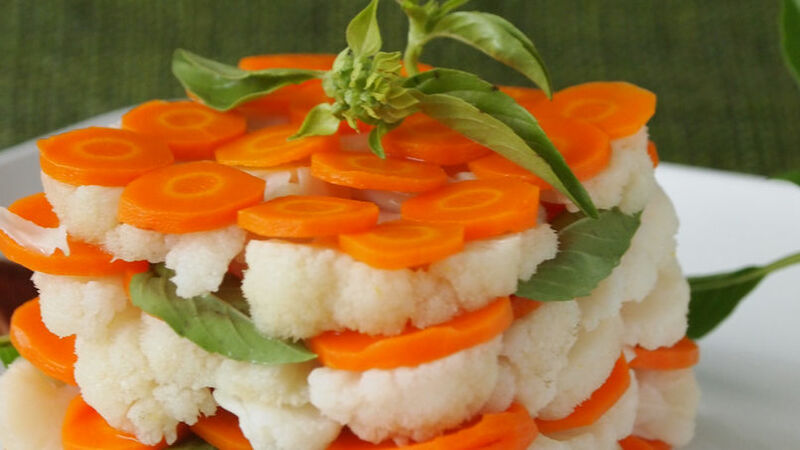 Make layers of vegetables, alternating between carrots, cauliflower and basil leaves. Season with salt and pepper. Repeat the layers. When you’re done, cover the vegetables with paper and apply weight to the top. Refrigerate for one hour and 30 minutes. Separately, heat oil over medium heat in a saucepan. Sautee the onions and garlic, when they start to brown add the red pepper paste. Stir well. Add the vegetable broth and let boil until its reduced half way. Lower the heat and add the chopped chocolate, stirring slowly until melted and combined with the sauce. At the end, add the butter to give the sauce a shiny texture. You can strain the sauce to make it entirely smooth or leave the little pieces of onion if you prefer. To serve brush a plate with the chocolate sauce. De-mold the terrine on top of the chocolate and decorate with more basil. For a more intense flavor, roast the vegetables. You might not believe it, but this recipe for chocolate with vegetables is not only original, it’s delicious too. You might not often hear that chocolate – usually reserved for pastries and strawberries- is amazing when combined with vegetables. Not with all vegetables, of course. They say, for example, that you should never combine onions with chocolate, but let me tell you that a few years ago I bought a jam in Barcelona that contained these two ingredients. Since taste varies from one person to another, I was so surprised to find how fantastic this mixture was on top of a pork chops. It was the perfect food pairing! I also enjoyed sheets of white chocolate with dehydrated black olive powder. I think the contrast of the salty olives against the sweet creamy white chocolate create a different and delicious taste. It’s never crossed my mind to combine those two ingredients! This terrine is made with 3 elements that combine perfectly with chocolate. If you’ve ever tried chocolate and basil mousse, or carrots dipped in chocolate, or if you’ve ever roasted cauliflower lightly sprinkled with salt, pepper and cocoa powder, then you know what I’m talking about. For the sauce, I’ve used dark chocolate. The spiciness comes from the red pepper paste that also gives it an earthy, smoky taste, as well as a delicious complexity. This sauce also goes well with chicken, pork, and turkey.